A thorough review of the officer class is being done in France, the variety of diseases astounds the reporter. 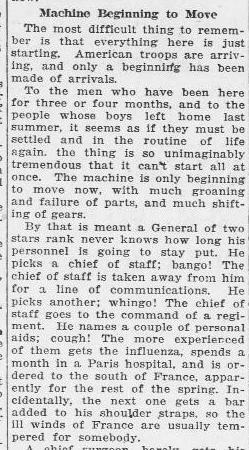 No command structure has been established, and the latest addition to undermining the war effort is influenza. The companion article describes the Gulf Stream is "on the rampage," with scientists speculating on the effect of oceanographic change. Source: "He Will Be On Deck to Welcome His Outfit Home," Bridgeport Farmer and Evening Times, Bridgeport, Connecticut, March 9, 1918. Page 1, Column 3.